Tomei began operations in 1968 as a race car tuner in Japan. Over the last 40 years Japan has emerged as one of the leaders in automotive research, racing, and culture. Tomei products have been utilized in nearly every motor sport imaginable. Tomeis racing heritage means their research and design team have first hand knowledge of the extreme demands racing puts on an engine. Using only the highest quality materials means that Tomeis products can handle the intense strain and heat a purpose built engine will experience whether it be on the street or the track. Tomeis attention to detail is second to none. All of their products are thoroughly researched and engineered to achieve optimal efficiency. Because of even miniscule differences in measurements can cause catastrophic engine failure, all Tomei products fall within strict tolerances. Tomei machines all of their engine components to enhance airflow and ensure proper fitment and seal. When a vehicle is making a sharp turn or under hard acceleration or deceleration it will cause the oil in the oil pan to slosh around, potentially starving the engine of oil. To prevent this a baffle is assembled in the pan of stock engine. Though it is sufficient for everyday driving, it simply isnt designed to perform under race conditions. This is because the size of the factory baffle is cut down to save on production costs. If the oil leans to one side during a sharp turn, air goes in to the pipe instead of oil and interrupts continuous oil lubrication. Without oil to lubricate them, engine components and metal surfaces are highly abrasive to one another. This causes much faster engine wear and temperatures will rise drastically. 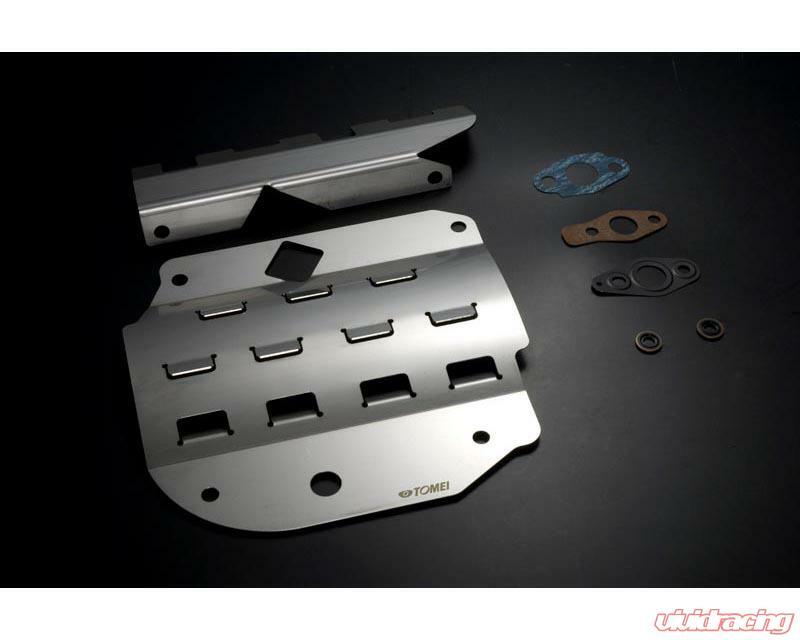 That is why Tomei's developed this slicing oil baffle. Tomeis baffle plate is made to achieve stable oil lubrication under extreme conditions such as sharp turns acceleration, and deceleration. It does this by preventing the oil from sloshing around during hard turns, ensuring that you have a steady stream of oil going through the engine. It also scoops excess engine off the crankshaft, decreasing friction and improving high rpm power.